You are here: > Home > Blog > Are You Going To Datacentre Summit South? If you’re in London next week then I recommend popping into the Data Centre Summit South at The Barbican Exhibition Centre. 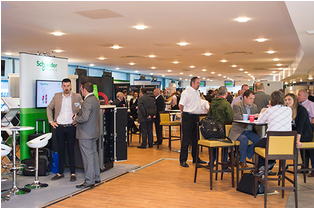 This southern event builds on the success last year of the event held by DataCentre Events Ltd at the home of Manchester City, the Madjeski Stadium. As a United supporter I would have preferred Old Trafford but the event at the Madjeski or Main Road as I still like to call it, was every good both for exhibitors and attendees. Why? Well it was busy and there was business to be done. A perfect combination to create the type of buzz you want at an industry show. The London event sees DataCentre Events rolling out the same winning formula to The Barbican Halls, London. The show was sold out some months ago and will feature a similar but wider mix of industry leading suppliers and speakers at this one day conference. The date: Wednesday 10th February. See what’s new in the industry and keep up to date with latest innovations and technologies. Catch up with your current suppliers and meet new ones, all in one day and saving precious time. Find new partners and business opportunities. Be part of the latest thinking and share the experience of other organisations. Find ways of saving money and developing your business. Visit the exhibition of leading vendors. The organisers, DataCentre Events Ltd are a new organisation but one formed by two of the industry’s best known publishers and event organisers. The new company is also supported by industry leading publications Netcomms Europe, Datacentre Hub, Cloud Computing World and Networks Ireland. So there is a lot of credibility behind them and I am sure this latest addition to the datacentre calendar will become a firm favorite for those in the industry and south of the country.